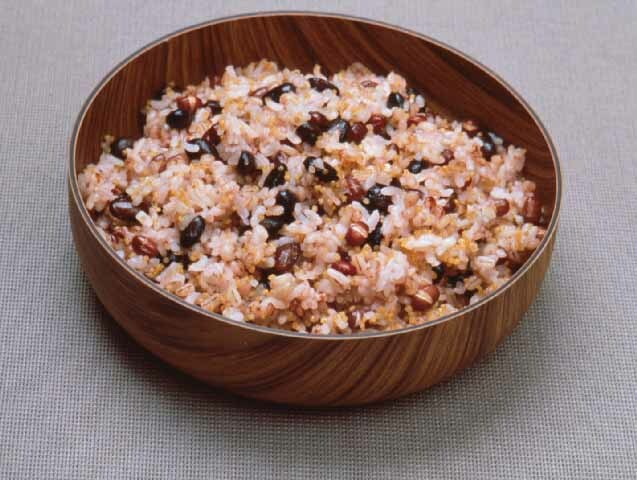 5 grains and beans rice (오곡밥; oh gok bap) – usually made with glutinous rice, red beans, black beans, millet, and sorghum, +/- your favorite/not-so-favorite grains and beans. Assortment of vegetables (나물; na mul) – traditionally this is the day to clean out the dried vegetables stored for the winter. I’ve become more appreciative of the seemingly simple daeboreum food because each element in one bowl and one plate requires careful preparation of its own. With 5 or more grains and beans, they cannot be just mixed together and left alone to be cooked in a rice cooker, which will result in undercooked beans and porridge-like rice and a whole range of textures in-between. A pressure cooker simplifies a few steps, but beans still need to be pre-soaked. Dried vegetables require soaking in water and cooking separately to bring out the flavors of their own. All the effort results in deceivingly simple, clean-tasting dishes. In recent years, my own celebration of daeboreum has been limited to looking for the full moon at night. Something that seems to capture more of the spirit of daeboreum is an oven baked rice cake commonly known as LA chap ssal tteok (LA 찹쌀떡). For a while, every time I made this, I added more and more beans, nuts, and dried fruits, using the base batter to hold everything together. Right out of the oven, the edges are crispy and the inside is sticky-soft. Once it’s cooled to room temperature, I cut it into smaller pieces, wrap them in plastic, and keep them in the freezer. Then I take one with me when I know I’ll have a long day out – it thaws nicely and tastes just like sticky tteok as it should (without the crispiness) in a couple of hours. It’s filling and loaded with energy boosting ingredients – ohgokbap and bureum in one, a tteok version of trail mix and energy bars. For these reasons, I have re-named my version as energy tteok. 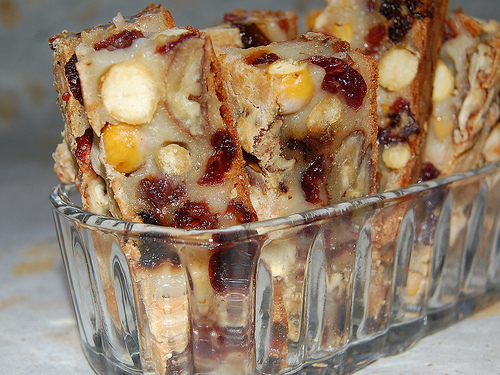 The receipe below makes one block of about 11″x7″x1″ (about 28x18x2.5cm). If you make this for the crispiness of oven-baked tteok and plan to finish it all right after baking, you can spread it on a cookie sheet pan to maximize the crust part. Dry Base ingredients) 2 Cups (C) glutinous rice flour (찹쌀가루; chap ssal ga ru, mochiko or sweet rice flour), 1 teaspoon (ts) baking powder, 1/2 ts salt, 2 Tablespoon (TBSP) sugar –> mix well. Wet Base ingredients) 1 egg, 1 1/2 C milk –> mix well. Additions above – variety and ratio – are a suggestion and my favorite combination these days. I’ve also used kidney beans, black beans, toasted walnuts, almonds, dried dates, dried apricots… Just make sure beans are cooked before folding into the base batter. Also, fold in from the sturdiest ingredients (usually dried fruits) to the softest (cooked beans). They say the Chinese used rice mortar to build part of the Great Wall. That explains why you have to use a jack hammer to get it off your pots after you cook it. LOL!